Recently, with the help of Things From Another World and their Nick And Dent section I’ve rediscovered the Aliens series of comic books and graphic novels that Dark Horse Comics published starting in 1988. This first volume collects “Outbreak”, “Nightmare Asylum” and “Female War”. These first three comic book miniseries were meant as sequels to the James Cameron directed Aliens. They feature Hicks and Newt as they deal with the aftermath of the mission to LV-426 and the events we saw in Aliens. As the stories continue another familiar face joins our heroes. I was a huge fan of the Aliens movies as a kid and when I saw these comic books on the shelves at a comic book store one day I had to have them. I lost them a long time ago and I had forgotten they even existed until I ran across the omnibus collections on TFAW. I was pleasantly surprised by how much fun these stories are and how much better they are compared to the sequels that followed Aliens. The stories collected here also hold up very well considering that they were made over twenty years ago. I am not too sure on this, but I believe these were the first major comic books to be done by Dark Horse. I think of them now as the Aliens version of the Star Wars Expanded Universe. The Aliens comic books aren’t considered canon because of what happens in the sequels. But, that doesn’t detract from the quality of the storytelling and art in this collection. To me, these comics are better than every movie after Aliens. They are that good. The miniseries collected here were first published in black and white. They have been redone in color and Dark Horse digital did a fantastic job with the coloring. Seeing and reading these in color for the first time was a treat. The art here is hideously gorgeous. 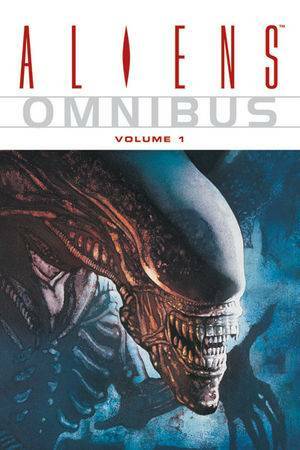 These stories are action packed and as gory as you would expect from an Aliens story. Mark Verheiden did an excellent job writing these. He captured the horror and sense of loss that Hicks and Newt feel as they deal with their trauma. The great art from Mark Nelson (Outbreak), Dan Beauvais (Nightmare Asylum) and Sam Keith (Female War) adds even more atmosphere to the stories. The alien creatures and face-huggers we’ve grown to love jump out at you. Great stuff and well worth tracking down. Highly recommended.